Isn't Internet shopping the greatest thing? You can sit in your jammies with coffee in hand and shop! No makeup, no car, just you and a chair and your computer. I've already decided I'll be doing most of my Christmas shopping on-line this year, as I can't imagine dragging a baby and a toddler to the mall and all over Creation to find gifts. I've been doing a bit of on-line shopping lately and wanted to share some of my favorite things with you. You know I love cake plates, right? 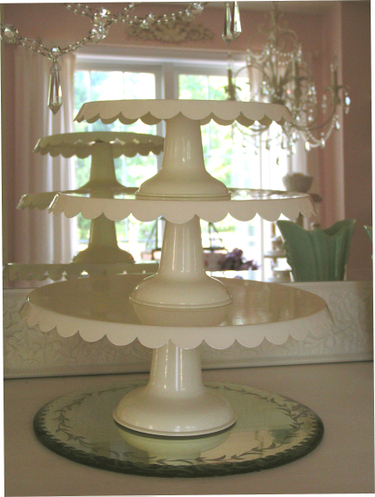 Well, when I saw this triple tiered one in ivory, with scallops, my heart skipped a beat. I went to Sadie Olive and bought one as fast as my mouse could clickity click. 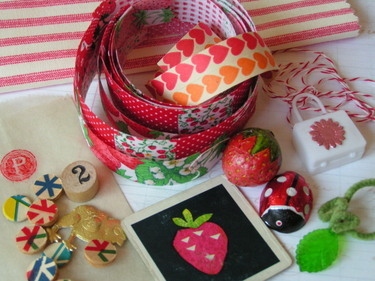 There are lots of lovely things to ooh and ahh over in Sara's shop. You will want to take a peek! Next stop, Parcel. I've never actually been to the brick and mortar store, but have plans to head up to Jersey one of these days and stop in for what I'm told is a fantastical visual treat. I ordered this sterling silver custom charm for my charm bracelet, and it is even more special in person. I couldn't decide whether or not to get "Andrea loves George" or "George loves Andrea". I guess it doesn't matter since we both love each other! But, isn't it just the sweetest keepsake? 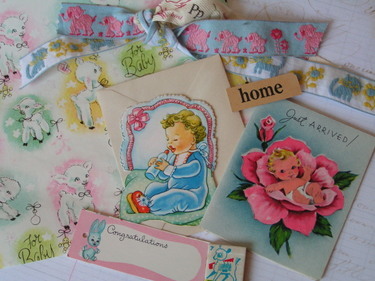 Nancy, the owner was so kind to include some extra vintage goodies in my order. She caught right on to the baby and strawberry themes I have had swirling in my head for a while now. Thank you Nancy! I love it all! 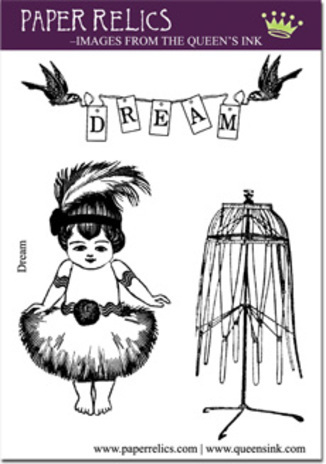 Then, just yesterday I found out that Hope's new line of whimsical stamps are available! I bought this one. You can get them all here at Paper Relics. And last but not least, I purchased this beautiful lampshade kit from Lori's etsy shop. 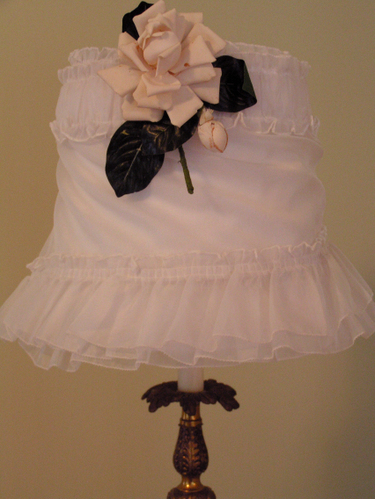 It transformed a very plain lampshade into something so lovely. I think she's only got one kit left. I don't know if there are more in the works, but everything she sells is just as pretty! So, those are some of my latest finds while shopping from a chair. I'll have more to share when my order from Heather's gorgeous shop, The Present Past, arrives! If you haven't been there, it's a must see, girls! 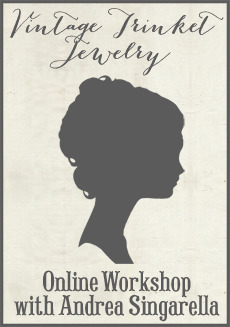 I'm with you on the online shopping! 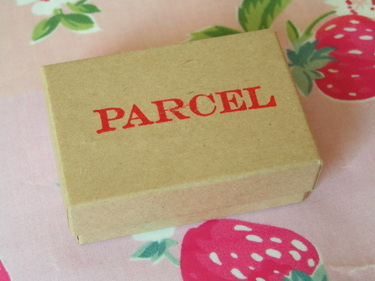 And thanks for mentioning Parcel - I had no idea it existed, and I live only about 30 minutes from there! I think I may have to wander over sometime and check it out in person. Thank you (I think) for the new recommendations. I'm gonna check them out. Don't you just love Heathers stuff? I'm waiting on an order too and I'm so excited. Of course don't forget YOU!! I ordered yesterday and I can hardly wait. I love watching the mail for goodies but sometimes it seems to take forever and it's only a few days..geez I'm impatient!! How cute is everything??? I especially love that charm. The stamps are really cute. I really need to sit down and do some shopping too. Hey Andrea i gave ya a shout out on my blog. check it out. You sure know where to shop! I love the strawberries everywhere. Online shopping is the best thing that ever happened to the world. I'm convinced. Oh the thrill of the mailbox! I haven't seen all these places so thanks for sharing. Love Lori and everything she makes! You are so sweet to mention my shop. Thank you so much. :) I am glad you like the cake plates. They look lovely in your photo. You got that right, shopping from a chair! You have a great blog and I enjoy reading it. Thanks for the online resources. I just received my cake plates just like yours, I bought mine at www.vintageweave.com. I would be in sad shape shopping if it wasn't for shopping from home. Although I have to be at a meeting in So Cal in a few weeks and plan to leave a day early to check out a few stores in LA. So cute!! I love the baby items!! I found your blog via my aunt and am adding a link to you!! I am so happy you liked the lampshade kit. It looks great. I need to go to Paper Relics right now. Oh...I love the vintage crepe paper from your shop. I recently discovered your blog and have been so inspired! This is the first time I have entered a "blog contest" but I have 3 teen/pre-teen daughters who would have lots of fun creating with the pretty German glitter. Thanks!